Backpacking Colombia – the ultimate guide. 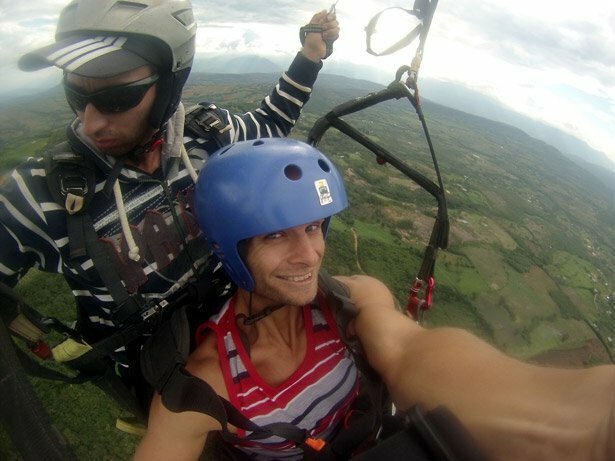 Colombia is an unreal country to travel, the people are very friendly, the food is amazing, there are some awesome activities to get your adrenaline pumping and the best is that it is very affordable. We had an amazing adventure Backpacking Colombia for one month drinking some unreal coffee and exploring a variety of interesting places from colonial cities and the Amazon to a beautiful desert. 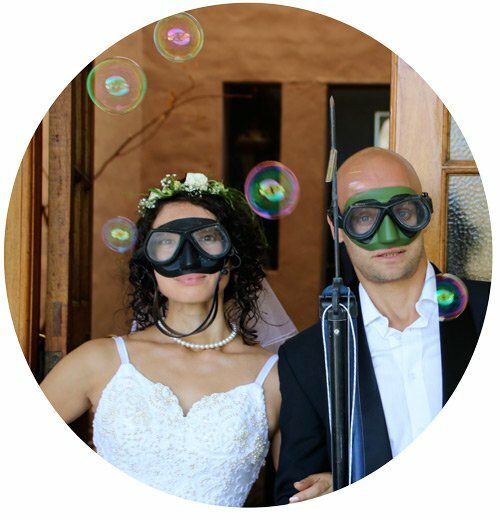 In this post we discuss our budget, adventure activities and details you need to plan an unreal trip! Is Traveling to Colombia safe? Few countries have done more to turn around their own image than Colombia, which was basically run by drug lords in the 1980s and ’90s and tourism was almost non-existent. Colombian President Juan Manuel Santos won the Nobel Peace Prize for his efforts to end the 52-year conflict with left-wing rebels. Backpacking is not considered dangerous here anymore and the international stigma is slowly wearing off as more and more travellers are realizing what an amazing destination this is. Theft is the most common travelers’ danger and is more common in big cities. The people in Colombia were some of the friendliest and most welcoming we have met in all our travels. Colombia is an extremely affordable country to travel and it was very easy to do on a backpacker budget. We spent 1 851 135 COP ($636) in 31 days, thus 59 714 COP ($20.50) per person day. 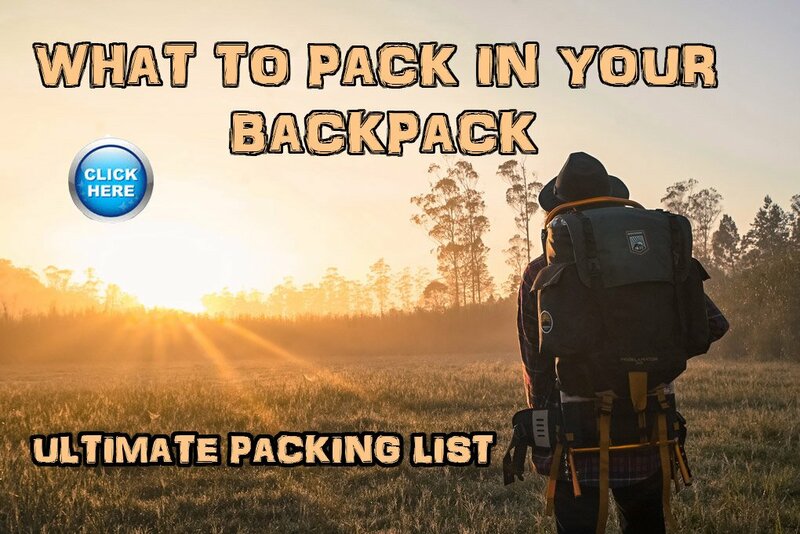 This includes all food, transport and other expenses, note this amount includes rafting, paragliding and a plane ticket from Bogota to Leticia. We spent very little on food by buying groceries in the supermarket and cooking in the hostel. Hostel prices varied between 15 000 and 30 000 COP ($5-$10) for a dormitory bed. We saved a lot on accommodation by taking night buses for longer distances, thus saving on a night’s accommodation. 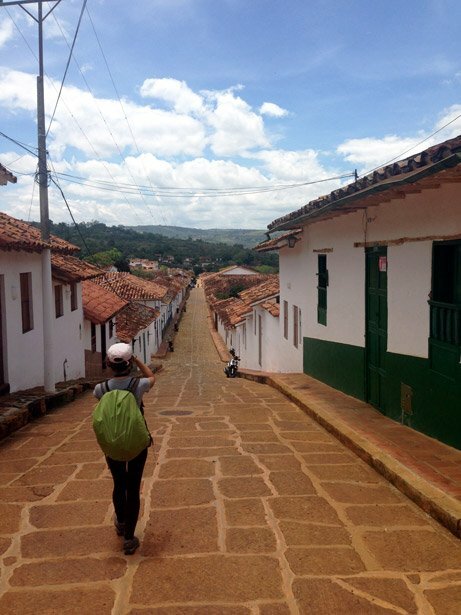 Alya hiking through one of many colonial towns on route, Barichara. We camped in the airport our first night in Medellin, even doing some laundry in the toilets (OK, I spilled some coffee on my t-shirt). Buses depart for El Poblado until 21:00 and we arrived in time, but did not feel like walking around looking for accommodation at night and we saved on a night’s accommodation,bonus! In the 1990’s Medellin was a dangerous place, it was the world cocaine capital led by drug lord Pablo Escobar, a modern day Robin Hood. How the Paisa people living here turned the city around, after he was shot by police, is an inspiring success story. Today it is a beautiful, modern city with parks, public art, museums and a sparkling clean, efficient metro system. The Metro Cable Line, taking the cable car is part of the Metro system and thus very cheap (2000 COP/ $0.60). There are three lines and the view of the city is amazing, also passing over the shanty town between the hills on the outskirts of town, an area that you probably would not otherwise see. Free Walking Tour: Our guide, Juliana, was fantastic telling and showing us this amazing city and its interesting history, her colourful stories is probably why we loved the city and its people so much. Museo de Antioqua: Art spanning 400 years, many works by Botero and other international artists. 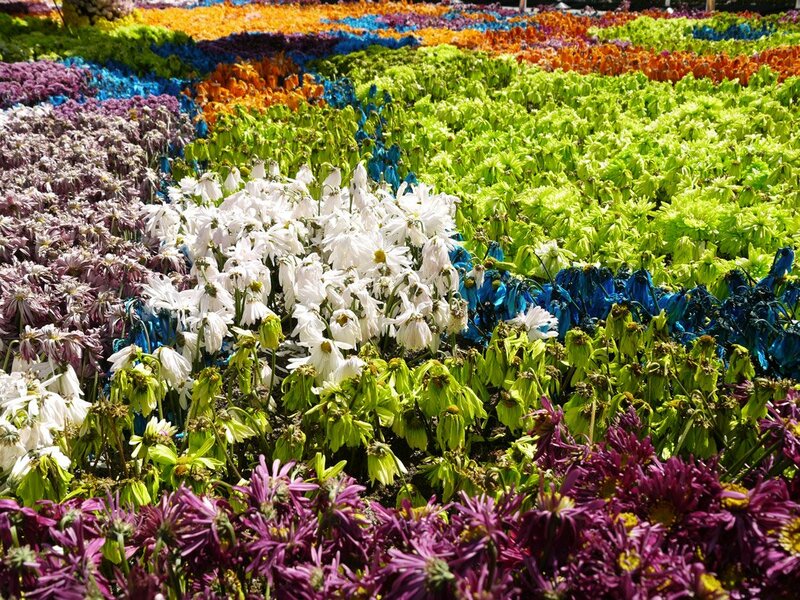 Looking for more things to do in Medellin? The city has a very efficient Metro system that cost about 2000-4000 COP (70c-$1.60) per day. Buses leave from the airport to El Poblado at regular intervals until 21:00 (9000 COP/$3). The bus from Medellin to Guatape cost 12500 COP ($4.30) for the 2.5 hour trip. Hostal Tamarindo, 22 000 COP ($7.50) for a dormitory bed in this nice, clean hostel with a good vibe and well equipped kitchen in the El Poblado neighbourhood. This is a safe, clean area with shops, restaurants and walking distance to a Metro stop. This small town is located next to a large lake, we did not see anybody swimming, but you can go for boat rides on the lake. 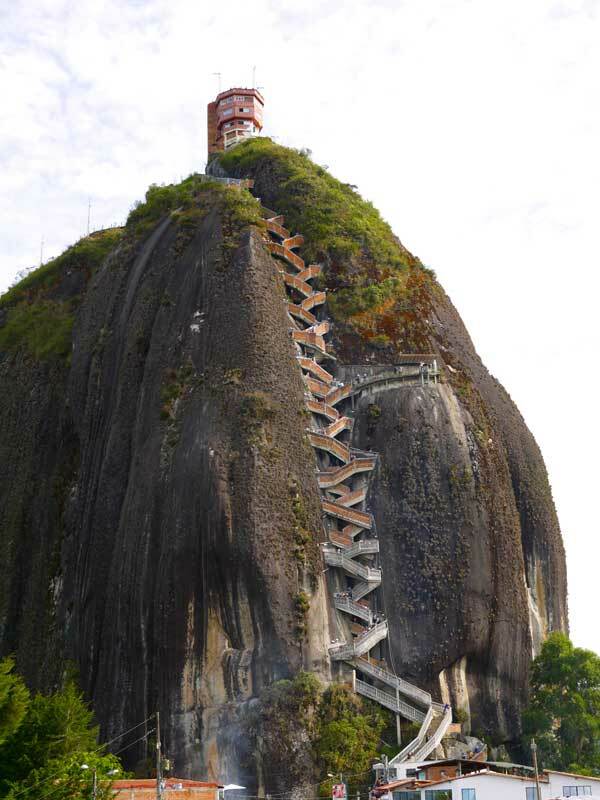 There is a massive rock next to the lake with about 600 steps leading to the top. We did a nice 5 hour walk around the lake and surrounding areas. 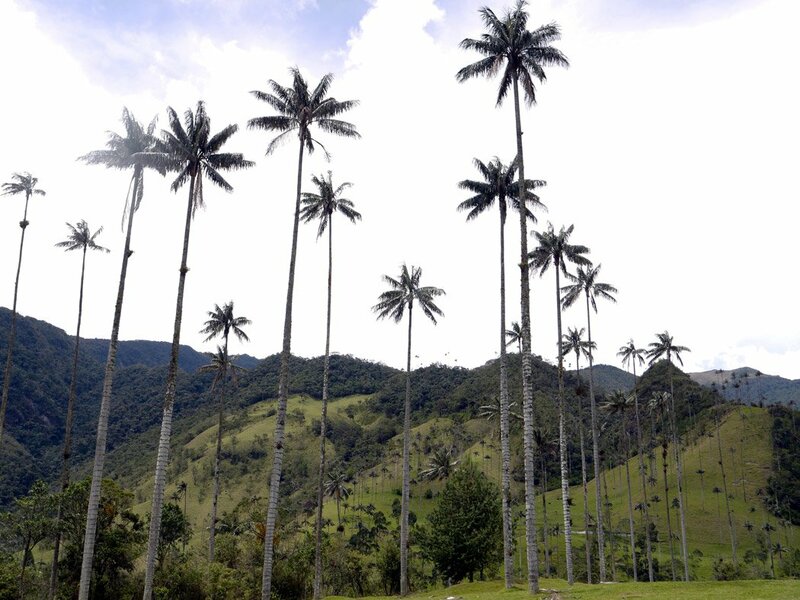 This nice small town had two big highlights, coffee and Valle de Cocora. 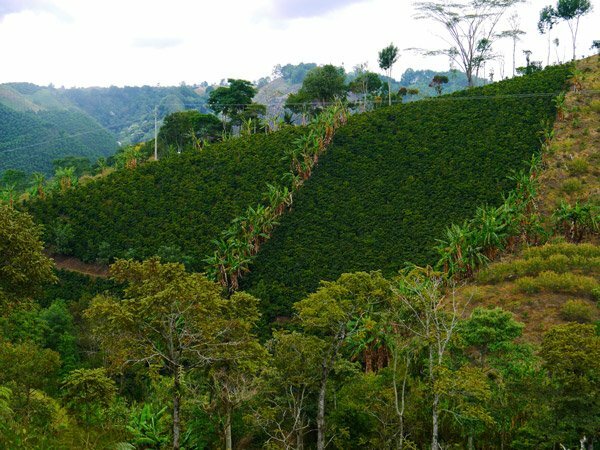 The town is located in the Zona Cafetera known for some of the best coffee in the world. I was exited since I love drinking and comparing coffee around the world. About an hour’s walk from town (I suppose you can take a taxi) we went to Finca el Ocaso, an organic coffee farm for a coffee tour during which the whole process from plant to cup was shown and explained (in English), followed by a tasting. The coffee was great and had a little bit of a natural sweet taste (yes without sugar). 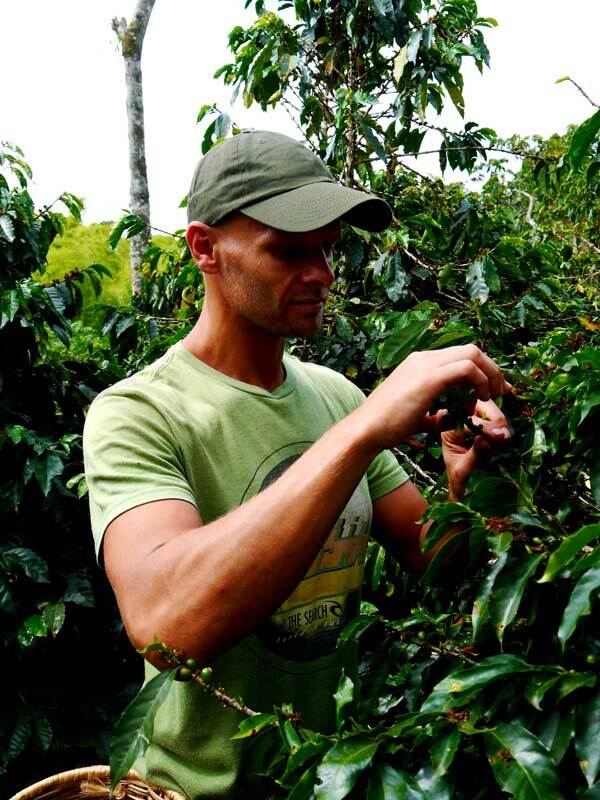 In the coffee plantation, Salento. Backpacking Colombia. The lush grass covered hills has many wax palms, thin, tall and towering above the forest, these unique trees looked strange and out of place covering the valleys and hills. We did a nice hike over the mountain for 2 or 3 hours, it is a big loop ending back at the parking area to catch a jeep back. Shared taxis leave from the town square to Valle de Cocora at regular intervals (when they are full, 3400 COP ($1.16). La Cassana Hostel had a good location in the center of town, 20 000 COP ($6.70) for a dorm bed per night. The kitchen was not very well equipped; the staff was friendly but not very familiar with the surrounding area and were clueless about possible activities. Some of our friends stayed in La Floresta Hostel, a bit out of town and they said it was clean with a nice kitchen, great staff and some hammocks in the garden. 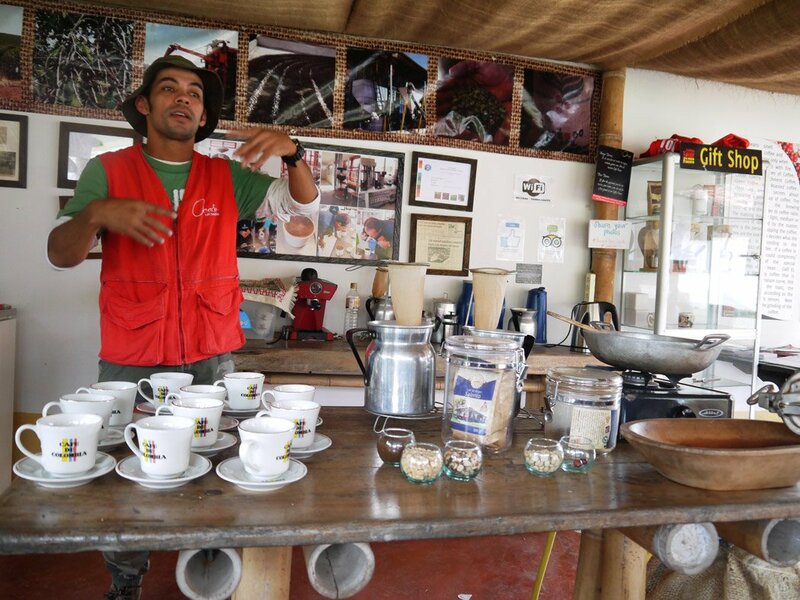 Coffee tasting Zona Cafetera, Salento. Backpacking Colombia. This was one of my favourite places of the beaten track. We camped in the desert between red and grey eroded sand ridges forming canyons and kopjes, a miniature Grand Canyon. It is a great area for hiking and taking photos surrounded by cacti and desert plants, canyons and a very unique eroded landscape. Take care not to get lost in the 45C heat, we were lost for a couple of minutes, but Alya has a great sense of direction (and I have GPS in my iPhone) so we figured out where we were before we were too dehydrated. We saw a wolf while hiking here, which was amazing. The desert is a great place to marvel at the night sky, sitting outside your tent looking up is unreal, for more professional star gazing Tatacoa has an observatory with professionals giving regular talks. Unfortunately there are criminals even in the middle of nowhere, a Spanish girl staying at our campsite got robbed at knife point very early in the morning while walking alone. Transport: Minibus from Neiva to Tatacoa was 15 000 COP ($5) per person. Walking around in the Tatacoa desert. The capital was our home away from home in Colombia. We stayed in the colonial quarter, La Candelaria, on both our visits to the city. La Candelaria: This neighborhood has cobblestone streets and many cafes, museums, hostels with many students and tourists hanging around in the area. We met up with our friends Ritchie and Milda, it was great to see this Irish couple that we met in Nicaragua again! We walked around the La Candelaria with beers covered in a paper bags. The neighborhood was alive with young people dancing, giving speeches and doing fire shows. La Candelaria is located at the foot of this 3200m high mount towering above the city, you can walk here from the Metro stop. There are steps all the way to the top and the walking up at a quick pace took Alya less than 40 min this old man lost her after a toilet stop and arrived about 10 minutes later, it can also be done by cable car 15 400 COP ($5), the view of the city is great. This free museum has more than a 100 pieces by the artist, normal Botero stuff, fat cats, fat dogs, fat people even paintings with The Mona Lisa, Jesus and Pablo Escobar with unusual inflated proportions. Also art by many other famous artists e.g. 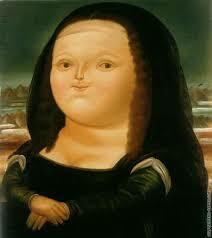 Picasso, Monet, Chagall and Renoir all donated by Botero. He must be an incredibly rich and patriotic guy, donating 100s of art works, worth millions to cities over Colombia. Interesting museum with themed rooms and good explanations (3000 COP/$1), free entrance on Sundays. Entrance 20 000 ($6.50) Interesting and beautiful, the new Antonio Banderas movie, 33, was filmed here. Alya says it is a lot less touristy and more beautiful than Zipaquira, the salt mine closer to the city. It did however take us 3 hours to get here by public transport from Candelaria costing 8000 COP/$2.70 for transport one way and making for a very long day. 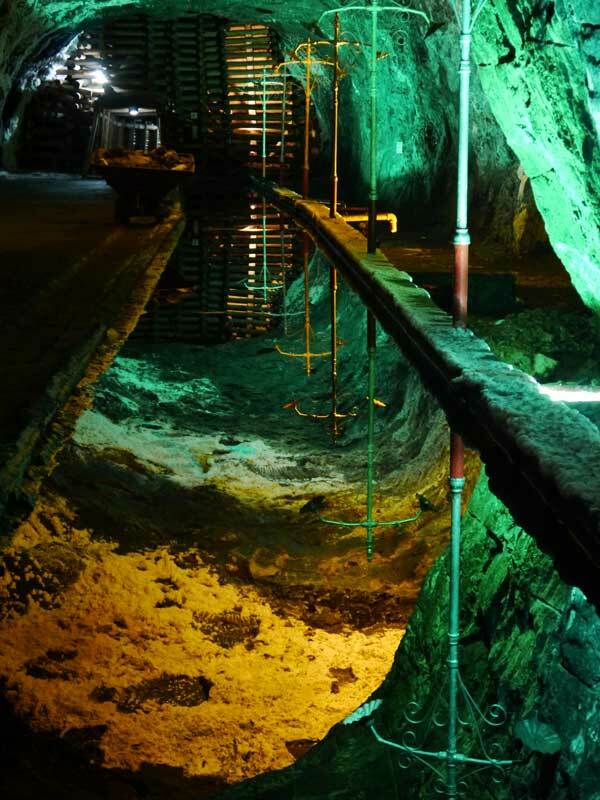 The beautiful Nemocon Saltmine, this was the location where they filmed the Antonio Banderas movie, 33. Backpacking Colombia. Bogota has a very efficient, cheap Millenium Meto Bus system, we spent about 4000 COP ($1.30) per day on transport in the city. Yepeto Hostel in La Candelaria was amazing, we paid 25 000 COP ($8) for a dorm bed and on our second visit they gave us a private room for the same price 50 000 COP ($16), including a good breakfast and there was always a pot of coffee on the stove. The staff was very hospitable and it felt like we were visiting old friends (well old Spanish speaking friends). We had so much fun here! This small city is definitely not a beauty, but the surrounding activities make it great. 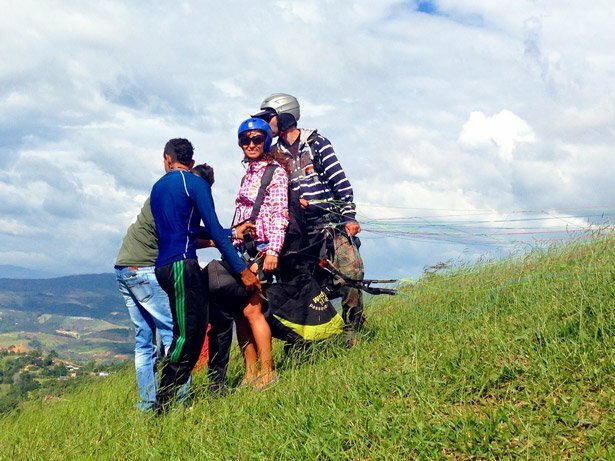 We do not do many tours or organized adventure activities while traveling due to budget constraints, but there were great looking activities in San Gil for good prices and we decided to let loose and do white water rafting, paragliding and several hikes. Alya paragliding around San Gil. Awesome place to do this for a very good price! Backpacking Colombia. 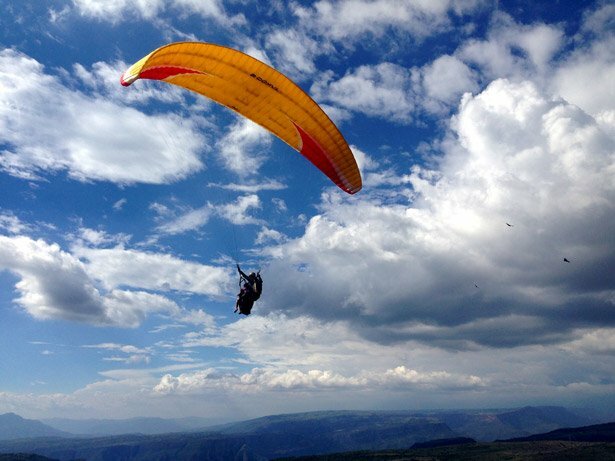 We went paragliding with Parpente Fenixtreme (60 000 COP/$20), a great trip excellent value for money. The flight was a tandem flight in the Chocomoca canyon. We started at the top of the canyon, each of us flying within a tandem harness. Rising hot air currents lifts the parachute and we ascended another 2000m. The flight with a maximum height of about 3000m and last for about 20 minutes. The views were unreal. Alya went flew first and recommended that I ask the pilot to do some helicopter manoeuvres which was great fun! Campbell flying over Chicamocha canyon near San Gil. Backpacking Colombia. 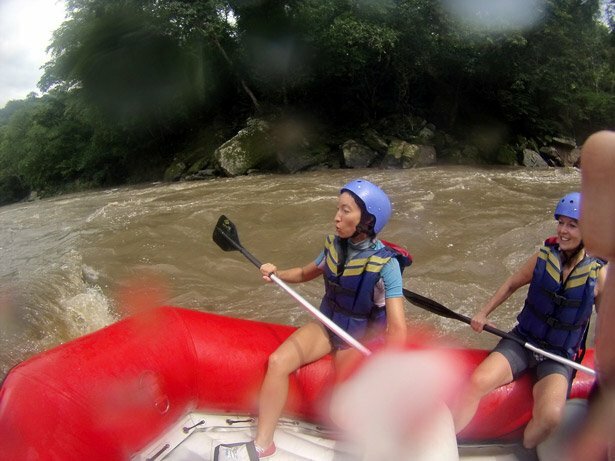 We did a one day rafting trip with Colombia Rafting Expediciones down the Rio Suarez (120 000 COP/$40). We spent about 2 hours rafting and went through several class 4 and a class 5 rapid. There was plenty of action and fun going through some big waves, we never flipped our raft, but did get thoroughly wet and went for a couple of swims. We had a half way break with lots of fruit and received a hot meal and some beers afterwards. 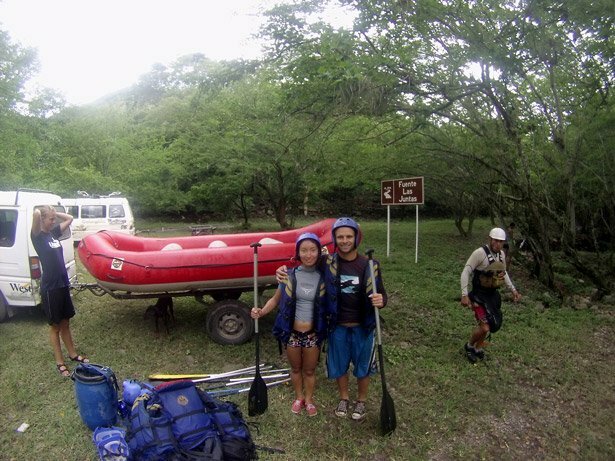 Alya, whitewater rafting, Rio Suarez near San Gil. Backpacking Colombia. There is a well-marked hiking trail that passes through several beautiful, small colonial towns that can take 1-3 days depending on which route you take. We started in Barichara, which was more beautiful than most of the famous colonial towns in Central America. 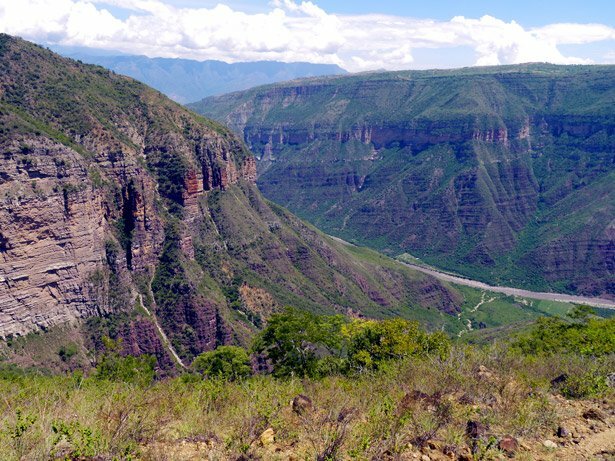 The highlight of the hike was passing through the Canyon del Chicamocha, it was a steep climb up and down and it was very hot, so try to not to pass through here at mid-day (yes we did) and take enough water (yes we did not). There are several small ‘towns’, Guane comes to mind a cowboy-like ghost town, with only a church and a bar that made us very happy by selling cold coke and water! We spent one night on the way in the town of Villanueva, the town was a bit of a dump but we found a nice hotel for $8 per room. The hiking trail was well explained to us by our hostel. We stayed in La Papilon Hostel in San Gil (15 000 COP/$5) for a dormitory bed. The friendly and helpful Swiss owner and his family lives in the hostel, he is knowledgeable about the area, explained hiking routes and offered good prices for activities. He is a good baker and shared his delicious freshly baked baguettes in the morning, I am happy that he thought the local bread is terrible, it resulted in him baking every day. This is a great hostel with good coffee, Wi fi and a well equipped kitchen. 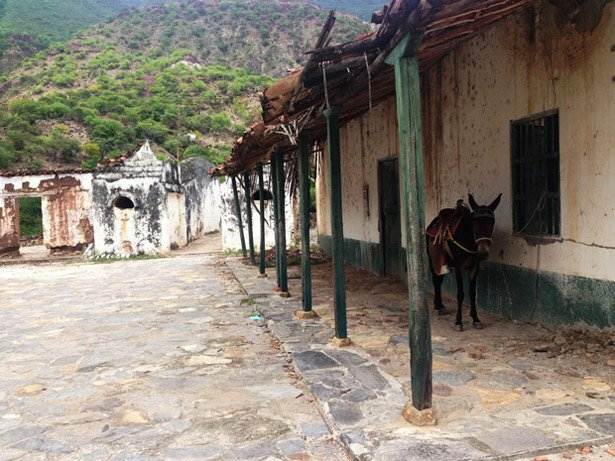 Hiking through a colonial ‘ghost town’ from San Gil. Backpacking Colombia. It is a beautiful little colonial town, but one of many that look so similar! In Central America these towns are some of the best sites to visit. Colombia has many other things to see and it is just another town. In my opinion the towns in Colombia were more authentic, cleaner, neater and nicer than in Central America. Accommodation: We stayed in Hostal Everest, 50 000 COP ($17) for a double room. This was a brand new guesthouse, very nice rooms, bathrooms and kitchen. The utilities in the kitchen were limited, but they were still busy opening. Good deal, very nice place. Our last stop in Colombia was deep in the Amazon jungle, 800km from the nearest highway. We flew from Bogota to the town of Leticia (167 555 COP/$58). Walking around in the jungle 10km out of town, about 40min walk from Omshanti Hostel where we were staying was interesting. We spotted some monkeys, birds and a snake. Afterwards we thought this was a nice place for independent bush camping in the Amazon jungle. Parrots at the main square: An incredible sight, thousands of parrots come at sunset to spend the night. Boat trip: Tabatinga (Brazil) and Leticia (Colombia) is basically one city with no border control in between. 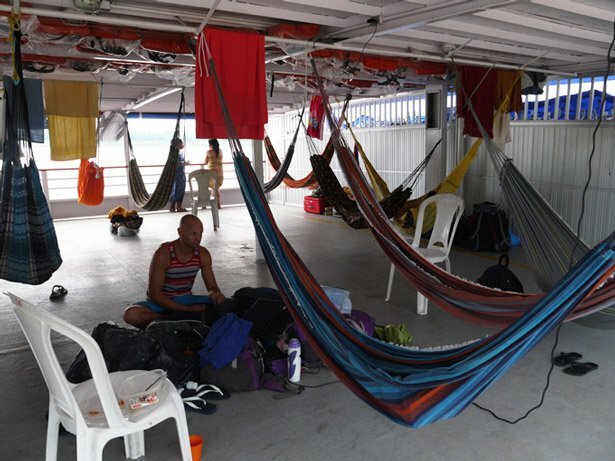 We organised a 4 day slowboat trip from Tabatinga to Manaus (Brazil) in the harbour. It is your responsibility to get stamped out of Colombia (do this at the airport) and find immigration in Tabatinga to get stamped into Brazil. I will recommend that you do this the day before departure since immigration in Tabatinga is only open a couple of hours a day. Mahatu Hostel, 20 000 COP ($7) for a dormitory bed. This hostel is located in town, it has ok wifi, a nice swimming pool and a basic kitchen. This is a nice place to stay when preparing for a boat trip or organise a jungle tour. Omshanti Hostel, 15 000 COP ($5) for a dormitory bed. It is walking distance (45 min) from the jungle if you want to walk around independently. The hostel is located inside a big garden making it feel like you are in the jungle. I preferred Mahatu Hostel. The hostel also organizes tours. Alya previously traveled for a month in Colombia, these following are some highlights from that trip. San Agustin, one of the most important archaeological sites in Colombia. Beautiful mountain area, nice waterfalls, interesting parks. Cartagena de Indias is a beautiful historical wall town with some beaches nearby. It is very touristy and quit expensive by Colombian standards but there are many cool things to do in Cartagena. Since Cartagena has an international airport many travelers start exploring Colombia in this historical city. It is easy to travel from Cartagena by bus to many surrounding locations. Tayrona National park has some very beautiful beaches, nice clean warm water, short hike paths in the jungle and several campsites. Las Lajas is a monastery on the border with Ecuador. It is an interesting place with picturesque views and worth it to stop for a couple of hours. Have a local plan your trip! For more guidance on planning a trip to Colombia, get in touch with the local experts at ViaHero. 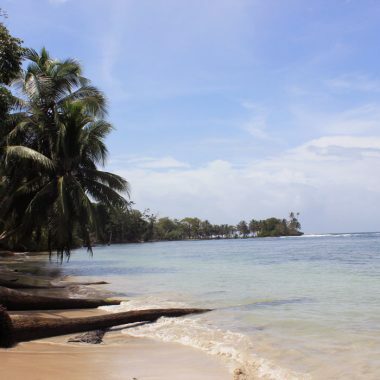 Their Colombia travel planners create custom trip plans based on your interests. You travel independently, but with email and phone support from a ViaHero expert before and during your trip. They’ll help with travel arrangements, and you’ll get a full itinerary with custom maps available offline in an app. I’d already heard of most of the places you recommend, but nothing about Leticia, which really sounds like an adventure. Adding it to my Colombia to-do list for sure. 5 days sleeping on a hammock on a boat to Brazil seems a bit much though… Thanks for the info! Interesting article! Now it is really safe to travel to Colombia than years ago. 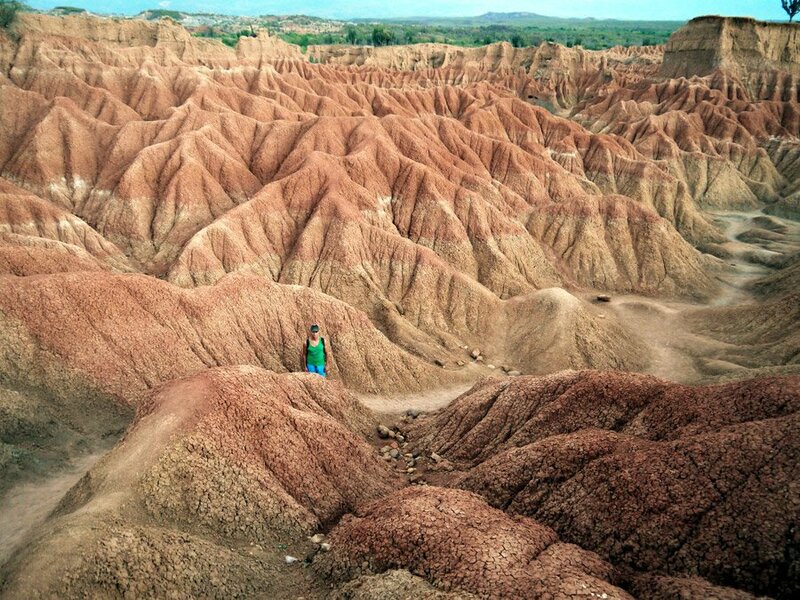 One of the places I loved the most also was the Tatacoa desert, it seems unreal in photos put it is really amazing! I would like to explore more destinations in Colombia in my next trip. Hey, I gather you guys didn’t hitchhike here but would you know how is the hitchhiking scene in Colombia? Hello, Manisha! Thank you for your question! We have some friends (including single traveling girls) who hitchhicked in Colombia and some of them didn’t have any problem some did. 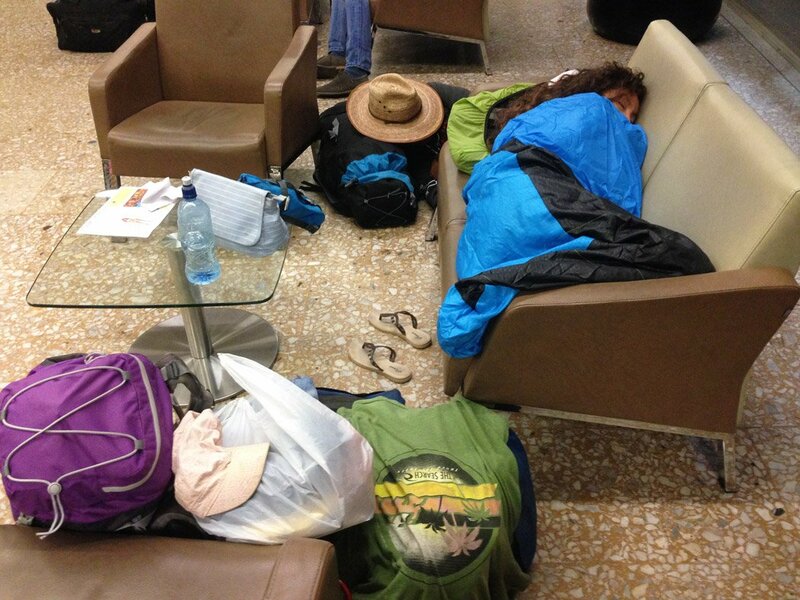 Our friends’ (a couple) backpack was stolen in Colombia while they were hitchhiking, a car just drove away with it. I wouldn’t do it alone (as a girl) in fact the only one country in SA I would hitch alone is Chile. Out other friend (girl) in Colombia had no problem hitchhiking but was robbed twice in Peru, the same scheme people drove away with her backpack. So it’s up to you to decide to take a risk or not! Hi, My question would be, how dangerous is travelling in Colombia? We are planning to go down to Ecuador once we looked around in Colombia but we can`t decide if we should take a flight or the bus is safe enough? What is your experience? Hello, Amanda! Thank you for the question! We found Colombia safe and travelled around by buses, we took only one flight to Leticia because there is no road there. I travelled by bus from Bogota to Ecuador (Quito) and back alone three years ago and didn’t have any problem. It’ll take longer than to fly but there are several nice places that you can visit on the way.